Bolaji Abdullahi, Abuja: The All Progressives Congress (APC) finds Wednesday’s statement attributed to Mr. Dayo Adeyeye, the purported spokesperson of a rump of the Peoples Democratic Party (PDP) quite regrettable. As a Party that was formerly in the opposition, the APC is aware of the role a thriving opposition can play in sustaining democracy. However, it appears that the marginal group that Adeyeye belongs believe that it is only by attacking the APC that it can find its relevance or gain the upper hand in the PDP’s internecine war. We need to remind Adeyeye’s group however that although Nigerians may have forgiven the PDP, two years after the Party left the country in ruins, but we have not forgotten. Nigerians have not forgotten that it was under the PDP-led administration that the terrorist group, Boko Haram seized a sizable portion of Nigeria’s territory, created a Caliphate and hoisted its own flags. It took the APC-led government of President Muhammadu Buhari to reclaim our territory and pride. Today, Boko Haram insurgents are virtually defeated and are on the run, and no millimetre of Nigerian territory is currently held by the insurgents. We have forgiven, but we have not forgotten. Under the PDP, a Party that does not consider corruption to be stealing, corruption enjoyed an unprecedented prosperity. Nigeria recorded some of the most unimaginable, shocking and astounding cases of corruption ever experienced in our history, or in the history of any country. Funds meant for the procurement of arms and ammunition required to fight the Boko Haram insurgency were stolen by agents of government and shared among themselves. It was a classic case of kleptocracy. The PDP-led administration was sending soldiers to battle without weapons and sharing the money. Worse still, when soldiers protested the lack of weaponry, the PDP-led administration added wickedness to weakness and court-martialled them, sentencing some of them to death, and others to long terms of imprisonment. If Nigerians have graciousness to forgive the PDP for the wanton corruption, we will not forget. Nigerians also remember that it was under the nose and watchful eyes of the PDP that over 250 Nigerian girls were abducted. It took the Party more than a month to even make a statement! PDP went about bandying conspiracy theories while innocent Nigerian girls were being held in captivity. Again, it took the APC-led administration to rescue some of the girls, while efforts are ongoing to free the rest. Yet, PDP had the audacity to counter the globally acclaimed hashtag, #BringBackOurGirls with their terribly insensitive #BringBackJonathan. We are willing to forgive even this; but we cannot forget. Nigerians will not forget that under the PDP, over 20 Nigerian youths died and thousands were seriously injured while looking for jobs. 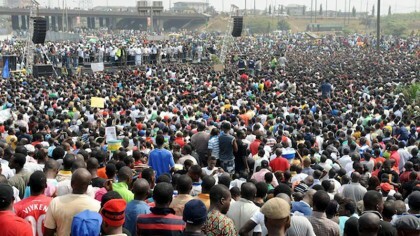 the PDP-led administration organised a fraudulent Nigerian Immigration Service (NIS) recruitment exercise and lured young people desperate for jobs to various stadiums across the country after extorting them. In the end, the exercise ended in tears, sorrows and blood. None of those who survived got the job and, worse still; the officials responsible for the calamity were protected by the PDP. We cannot forget. Nigerians remember that under the PDP, whistle-blowing was a crime. When a former Central Bank of Nigeria (CBN) governor exposed the stealing of $20 billion from the national treasury, he was suspended and hounded out of the government. We have not forgotten. If we have not been talking about this plethora of PDP iniquities, it is not because we have forgotten. Instead, we have chosen to pick up the pieces of the PDP wreckage and move the country forward. This, we have endeavoured to do in the last two years since Nigerians unanimously rejected the PDP for their wanton profligacy and misrule. Nigerians are a forgiving people, and that is why a self-appointed spokesman of what is left of the PDP could have the effrontery to make the kind of statements attributed to Adeyeye. But Nigerians will not forget in a hurry, the years of the locust.